Melissa is the newest member of the I-DEEL team. Her background is in animal science, having studied Animal and Veterinary Bioscience at The University of Sydney, and completing her honours research project developing and modifying diluents to cryopreserve rabbit spermatozoa. This year she will be helping Rose with her PhD, as well as performing meta-analyses with Losia, and assisting to develop high-throughput behavioural screening assays for zebrafish at The Garvan Institute of Medical Research ﻿﻿in their Diabetes and Metabolism division, under the guidance of Shinichi. I completed my bachelor of Animal and Veterinary Bioscience at The University of Sydney (2010-2014). During my honours year (2014) I developed and modified diluents to cryopreserve rabbit spermatozoa (supervised by Dr. Roslyn Bathgate, co-supervised by Dr. Danielle Johinke); assessing sperm motility via Computer Assisted Sperm Analyser (CASA), and membrane and acrosome integrity via flow cytometry and fluorescent microscopy. 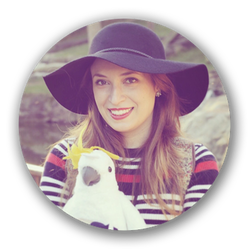 In early 2015 I began working as a veterinary nurse, and then in September 2015 began a research project with the Behavioural Studies Unit at Taronga Zoo (supervised by Dr. ﻿Vicky Melfi﻿, Dr. ﻿Jessica Meade﻿ and Alicia Burns); looking at the effects of foraging interventions on the behaviour and welfare of captive red-tailed black cockatoos (manuscript under development). From there, I realised my love for animal behaviour, and was drawn directly to this research internship with I-DEEL. I love animals, art and photography. I have many animals at home (including dogs, rabbits, guinea pigs, turtles and cockatiels), and am undergoing further studies in veterinary nursing. I also enjoy photography and digital art, and occasionally accept commissions as a digital graphic artist from people all around the world.